November 10th Show : Blog Of The Nation In our first hour of Talk of the Nation, the political junkie in Cleveland, and Harvey Pekar and the American dream. In our second hour, the changing face of American manufacturing, and reclaiming abandoned properties. 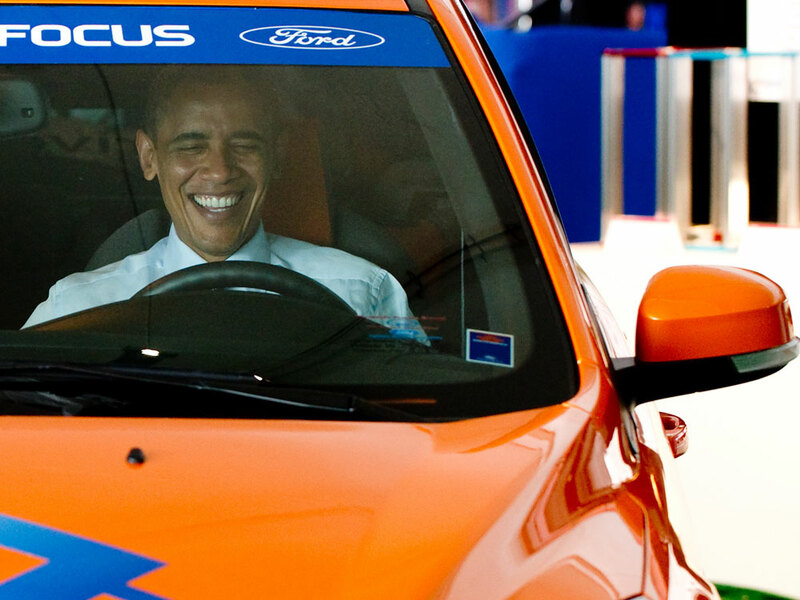 U.S. President Barack Obama sits in an electric Ford Focus following a groundbreaking ceremony for Compact Power's new advanced battery factory in Holland, Michigan, July 15, 2010. In our second hour, Neal Conan talks about the changing face of American manufacturing. A week after the 2010 midterms, Neal Conan and Ken Rudin head for the deeply purple state of Ohio -- where Republicans not only took five congressional seats, but every statewide office including the governor's mansion. Jim Renacci, who beat out Democrat John Boccieri in Ohio's 16th district, talks about his win and his future plans for the state. Neal and Ken will also look at what the wider GOP victory means for Ohio. Cleveland and the comic world lost a giant when Harvey Pekar died in July. For decades, the son of Polish immigrants chronicled his life -- and the everyman -- in his autobiographical comics and graphic novels. And while his stories were about the nitty-gritty of day-to-day working class life, they were also stories about Cleveland, where Pekar lived and worked. Writer and culture critic Jimi Izrael, another Cleveland native, calls the late comic book writer a mentor, and says that Pekar's life and work were the embodiment of the American dream. He talks with host Neal Conan about what Pekar's comics can tell us about the American experience. After several years of gloomy economic news and sobering unemployment figures, there may be a signs of a modest recovery in one important sector of the U.S. economy -- manufacturing. A recent Brookings Institution study ranked greater Cleveland second in manufacturing job growth (just behind the nearby city of Youngstown) in the second quarter of 2010. Still, U.S. manufacturing has likely changed forever. Instead of just cars and trucks driving the uptick, some factories now produce wind turbine bolts and medical imaging supplies. And the days when someone with only a high school degree could make a good living on the factory floor may be over. Host Neal Conan talks with Micheline Maynard of the Changing Gears reporting project about the changing face of American manufacturing. Factories may be slowly adding jobs across the American heartland, but decades of cutbacks in the so-called Rust Belt and the recent foreclosure crisis have left Cleveland -- like many other former manufacturing powerhouses -- with vast tracts of vacant lots, empty warehouses and abandoned homes. More than 8,000 properties are slated to be cleared in coming months, and Clevelanders are developing new ways to make use of those empty lots and obsolete buildings. Some encourage urban farming, others hope to reclaim -- and resell -- everything from wood to electrical wiring. Mhari Saito, with member station WCPN, joins host Neal Conan to explain how Cleveland is trying to reclaim and transform a shrinking city.